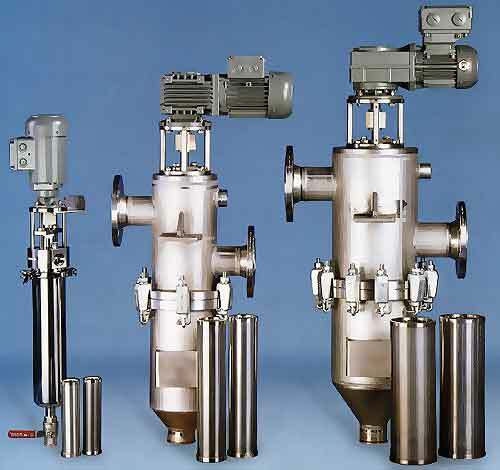 The robust WWS filter with its motor-driven cleaning device is suitable for the separation of suspensions as well as the continuous separation of solid particles from liquids whose viscosity range from water-thin to pasty. Therefore it offers a wide range of application possibilities throughout the entire processing industry. The liquid flows from the outside to the inside of the wedge wire screen and leaves the filter housing through the higher placed exit. Between the lower placed entrance and the upper exit a seal is placed, limiting any cross contamination between lower part (dirt) and upper part (clean). Dirt and particles are retained on the outside of the screen and are continuously removed from the filter element with a flexible scraper blade. The dirt is directed to the sump by a laminar flow in the filter and collected in the bottom part of the filter housing. This collection chamber may be purged either manually or automatically through a valve. An automatic purge system can be set up including an actuator and a time controller or pressure differential initiated valves. The installation of a manual bypass function is advised. Liquid loss is limited. Clogging of the filter is almost impossible, because of the special construction of the wedge shaped filter element wires. The filter fineness is established by the width between the wedge formed wires. The elements can be changed without any special tools. The automatic strainer is available skid mounted and can be supplied for wall or machine attachment or as a stand-alone unit. The filter housing is constructed in two parts and is easy to open. By loosening the quick clamps or hexagonal bolts the lower part, including the sump, can be removed downwards (only the larger models require a dismounting upwards, removing cover, motor and filter element simultaneously). The filter elements can be removed without special tools and are easy to clean when required. The various design types are made of steel or stainless steel, with or without heat jacket, and enables this versatile filter to be employed for numerous applications. Continuous cleaning of the filter surface ensures minimum pressure drop. The use of different construction material and equipment facilitates application possibilities for the filter in every field of industry. Installed before pumps or other equipment the filter extends the life of such. Under ‘Documentation‘ you can download more information about this and other systems and applications. For further questions, please contact us.